"Deadly Instinct" is magnificently illustrated with astonishing, award-winning, multi-shot cinematic sequences which portray life-or-death encounters move by move. 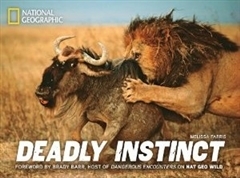 Telling its stories through fast-moving text and candid interviews with renowned wildlife photographers, "Deadly Instinct" examines the relationship between predator and prey, mate and rival, subject and photographer, life and death. Remarkable shots capture heart-stopping moments in the timeless battle for sustenance and survival. To capture this stunning collection, the photographers used their well-honed skills, field-tested courage, and high-tech tools such as infrared sensors and the ingenious Carcass Cam. Edgy narrative and brutally realistic scenes target today's readers and viewers. Throughout, the content reflects current knowledge in the field of wildlife science. This riveting book reveals, as only National Geographic can, the universal drive to eat and survive. "Deadly Instinct" is split into short chapters, each opening with a quick essay and punctuated by sidebar interviews with leading wildlife photographers. National Geographic luminaries such as Paul Nicklen, Joel Sartore, Chris Johns, Nick Nichols, Brian Skerry, Steve Winter, Tim Layman, and Dereck and Beverly Joubert relate harrowing personal accounts of their most dangerous and exhilarating wildlife shoots, complete with tense moments, life-threatening situations, and narrow escapes.